S/Ldr Aitkens took over as C.O. of the squadron on Sept 01, 1943 and began the process of converting the 113 from three man crew, twin engine Blenheims to single pilot, single engine Hurricane IIc fighter aircraft. With postings for all navigators, air-gunners, and some of the pilots to other duties, the balance of the squadron moved via Khargpur to Yelahanka, near Bangalore and on 31st commenced conversion to the Hawker Hurricane for use in what at first was expected to be a fighter role as part of the defence of India. These Hurricanes however had been modified to carry bombs and were often referred to as Hurribombers. "It was to be a bad idea"
This took all of September followed by other periods of intensive training at St. Thomas' Mount Madras, and Cholavarum. Throughout October & November S/Ldr Aitkens worked up the new 113 Squadron but sadly would never get to take the squadron into battle as he was struck down with jaundice 03/01/1944 and relieved of command. How much this hurt him is evidenced by the entry in his log. "Lost the best job of my life thanks to Bloody India." F/Lt Stanley Chilton D.F.C. comments on this period: In the autumn of 1943 113 Squadron got rid of it’s Blenheim aircraft and commenced conversion onto Hurricane II C’s at St Thomas Mount near Madras for an intended fighter role. Some of the Blenheim pilots remained and others (like myself) with previous single-engine experience were drafted in from North Africa. W/O Johnny Bott describes this period and 'the missing bar stock' incident: "The 113 moved to St Thomas Mount, near Madras in Southern India where we converted through Harvards to Hurricanes. 146 sqdn did the conversion. Our Navs and Airgunners from the Blenheims joined 2 seat 'so called dive bombers' called Vengeancers which I think were seconded to the Indian Air Force. It was all a shambles. 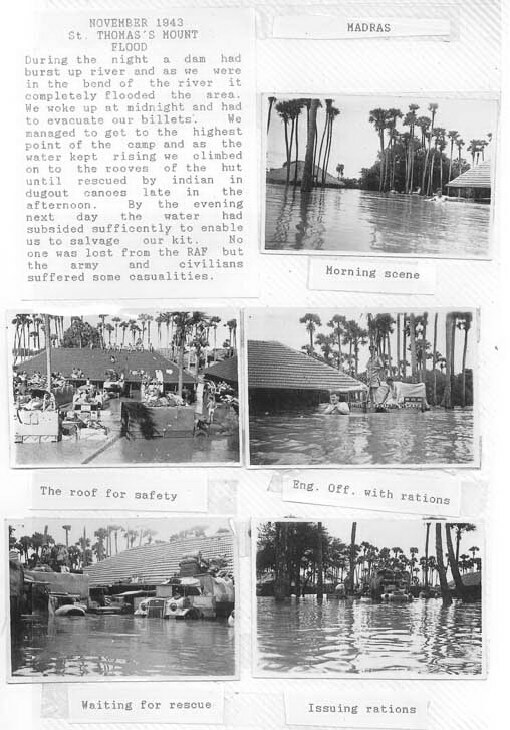 However while we were there a huge dam broke and we awoke to be floating in our charpoys and the water rising fast. We eventually had to climb on the roof of our basher and watch the water rise. The rats we saw were bigger than cats. The rise slowed down and a few of my mates swam under water into the Officers mess and stole a whole load of grog. We then strode off when we could into a hotel in Madras and drank our illicit grog. I used to know the name of it. There was of course hell to pay, but the few lads who were missing were rounded up and we were on our way back to Bangalore to finish the conversion on an airfield called Cholavarum" sorry Johnny it slipped out. Sgt Norman Say LAC also comments on this event which quite obviously provided some comic relief to the usual stresses of squadron life: The camp was in the bend of a river and one night we had gone to bed when a truck arrived with a crowd back from town. I woke up and heard them saying, ‘There’s a lot of water around.’ I could hear them splashing about. I put my hand out of the bed down to the ground: there was about three inches of water, so I yelled over to Sid, ‘There’s a lot of water on the floor!’ ‘Don’t talk silly.’ ‘I tell you there’s water, put your hand out of the bed.’ He did so and hollered ‘My boots are down there.’ He grabbed his boots up. I said, ‘I think the water’s rising’ and put my hand down again; it was now at least four inches deep. Of course we jumped up, grabbed some clothes, quickly put them on, got out on to the veranda and down on to the path. The water was now up to our chests. It really began to worry us because we thought, how high is this water going to come? Everyone was milling round but the truck was still there and the driver said,’Climb on and I’ll drive to higher ground.’ So he drove to the highest ground around there and pulled up alongside one of the huts. We all stayed in the truck and the water came up until we had to climb on to the truck roof. It still kept on rising so we got on to the hut and climbed up to the peak of the roof. The water rose until it was a couple of inches away from our feet and then it stopped rising. Apparently what had happened was that there had been very heavy rainfall for several days and a dam up in the mountains had burst. As we were in the bend of the river it had completely flooded it and also it had flooded the poor quarter of Madras where a number of people were drowned. We were lucky, we lost no one, but a nearby army camp had one casualty. One of the army chaps was swept away and wedged in a tree from which he was rescued. The water was very strong and uprooted trees in its path. A couple of the officers managed to get hold of a bed, put the legs in old petrol cans so that it floated and swam down to the cookhouse towing it behind them. They got a pile of tinned food and came round to the various groups on the rooftops dishing out food. One of our signallers was in a brick building manning the radio, he was on the second floor and the water came up to his chest. He knew that he couldn’t get out the normal way, so he piled chairs up on the table, broke his way through the roof, clambered through and watched the water rise until it was only six inches from the top. We were on the roof until late in the afternoon when some natives in dugout canoes managed to take us off. When the water went down we returned to the camp to salvage our kit. The water had turned the beds upside down and washed them all to the end of the hut, and you’d never imagine the number of insects and bugs which had been washed out of them. Also a lot of small animals and snakes had been left stranded around the camp. We got our kit and laid it all out to dry, and eventually got the camps straightened out. At least we knew that we wouldn’t be bothered by bed bugs for a while." With training and working-up completed during November and December 1943 the squadron was accepted as operational once again and on 20/12/1943 15 Hurricanes left Cholavarum flying over 2 days by way of Vizag, Alipore and Digri to the front line airstrip at Manipur Road. F/Lt S.N. 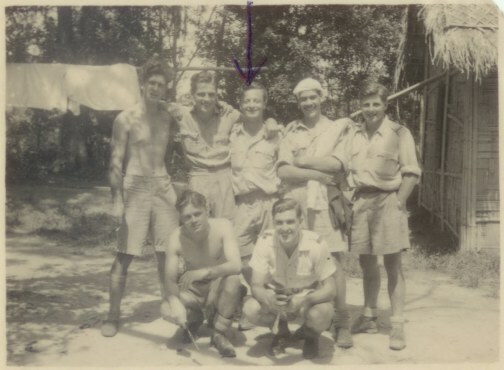 Chilton D.F.C comments: just before Christmas 1943, 15 aircraft, under the command of F/Lt Hart, flew up to an airstrip in North East Assam called Dimapur. This was adjacent to the Bengal Assam railway and also the so-called Manipur road, which was the main, indeed the only route to central Burma. Here at Dimapur the initial activity was further training in fighter tactics: battle formation, interceptions, air-to-air firing and the like. F/Lt S.N. Chilton D.F.C. continues: Japanese aircraft however were conspicuous by their absence (ie: no enemy to exercise their new fighter training skills), but the squadron managed to lose 5 aircraft on a training flight when it got caught up in a very strong Cu. Nimb. cloud, which scattered the aircraft far and wide. Fortunately the pilots concerned managed to bale out safely. Tired of our inactivity, the ruling powers decided to deploy the squadron on low level strafing attacks mainly along the River Chindwin, using the 4 x 20mm cannons to good effect. The first operational sortie was just such an attack and took place in January 1944. This was to set the pattern for the future deployment of the squadron as a close support unit for the army in a ground attack role for the remainder of the Burma campaign. It is doubtfull anyone on the Squadron realized it, but this was a historic juncture for the 113 Squadron, that being a return to the army support role which it had played intermittently in the years gone by and for which it had been founded in the First World War. In any case, fighter squadron or otherwise, this minimal experience gained in Army cooperation following the completion of training could not have worked out better or more timely. With some battle experience in hand, the 113 was in position and ready in time to play a vital role in the great battle of Imphal for which the Japanese army had amassed a total of 100,000 crack troops with air support. The goal being to drive the British and Allied forces back out of Burma and supposedly continue on into India, or as their battle plan put it, `To march to Delhi'. While it can be argued that the Japanese did not seriously plan toward the conquest of India, it still remained absolutely vital to them to keep the British and Americans from re-establishing the flow of supplies to the Chinese through Burma. The first serious moves by the Japanese came in mid March 1944 and throughout this momentous period and turning point of the war the 113 played a full part in constant and close (very close at times) support of the army throughout the siege that followed. F/Lt Stanley Chilton D.F.C explains this period in detail: On 20 March, the Japanese began a major offensive up the Manipur Road. The road runs through a large plain, about 25 miles long and 10 miles wide, about 3000ft up in the Naga Hills. This contained the town of Imphal, the capital of the Manipur state and thus was known as the Imphal Valley, (which became ‘the Valley’ to the RAF). This contained 6 airstrips and 113 moved to one of them called Tulihal on 22/03/1944. Since ground attack was obviously going to be the role, the aircraft were now fitted with the 250lb bombs, one under each wing and for the next year or so the squadron carried out bombing and strafing attacks every day, weather permitting. This was very close support and the squadron was briefed by an Army Liaison Officer, Major Teddy Kenington and frequently helped by smoke bombs put down by the army. Targets initially were in the jungle-covered hills south of Imphal and aircraft used either dive-bombing techniques or, where possible, low-level strikes with 11 sec. delay bombs, which were more accurate. The Losses incurred by the 113 began almost from the start of the battle, when on 23/03/1944, three aircraft did not return to Tulihal from an attack on Layshi, `a very sad day for 113' says the Record Book. One of the pilots, F/Sgt. Clement, got back to the British lines but the other two were lost. 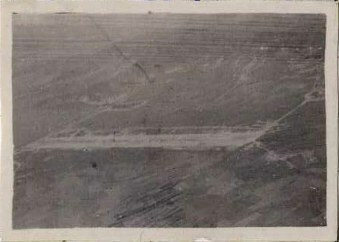 At about this time Tulihal itself was strafed by six Japanese aircraft and because of this obvious danger to precious aircraft on the ground with little protection from such attacks it was decided that they should be operated further back from the front line, first at Silchar in Assam and later Patharkandi with Tulihal being used during daylight hours for quick refuelling and rearming between sorties. Ground staff had to stay on for this purpose and as the airfield was `boxed in' for a period with the enemy close around they had a busy time servicing aircraft during the day and taking their share of guard duties at night to combat infiltrators. These poor Ground Crews, soon to be trapped, were to be caught up in a horror and hell that would cost many of them their lives. F/Lt Stanley Chilton D.F.C while acknowledging the danger, explains another more humourous reason for this move: The airfields in the valley were becoming overcrowded (at it’s peak their were 11 Hurricane squadrons, 5 Spitfire squadrons, 3 Vengeance squadrons and numerous Dakota squadrons) so in late March, 113 was moved out to Silchar and then Patharkandi in Assam about 70 miles West, flying in daily to Tulihal for rearming and refuelling. The routine each day was we would fly into the Valley, bomb up, carry out one or two operations and then return to our base in Assam. We did'nt mind this too much because the strips in the valley were subjected to bombing and strafing by the Japs at this time. Occasionally we could'nt fly back to our base for some reason (usually weather) and then we had to kip down where we could, using our parachutes as pillows. It was now that disaster struck and the famous siege began. The stakes were high and the eyes of the world turned to this small far away battle. F/Lt Chilton D.F.C continues: In April the Japanese cut the road north of Imphal, down which all the allies supplies came and from then until the end of June the valley was in a state of siege. All supplies (including our bombs, ammunition and fuel) were flown in by Dakotas and Wellingtons, which must have been a logistical nightmare. It was rather unnerving to see a Wellington land, taxi into our dispersal, open its bomb doors and drop a load of bombs on the tarmac (unfused, of course). The squadron remained based at Patharkandi with Tulihal as a forward base for about seven weeks following which it was ordered forward again to Palel, described officially as `monsoon quarters', but the move was only to take place `as soon as the bombing stops', as the Operations Record Book puts it, an odd order in view of the danger everywhere in the siege area, but after a few days the final move to the new base took place on 25/05/1944. end of the valley and uncomfortably close to the front line. Some of the targets were literally within sight from high points near the squadron's dispersal. At least there were no problems finding one's way home but the downside was that the strip was within shelling distance of the Japanese guns.